In late 2016, a YouTube video entitled “Gender Reveal Party Fail” went viral. The video shows a couple named Joe and Leela Krummel standing over a large box covered in pastel pink and blue polka dots. During the brief 31-second clip, you can hear a group of people chat excitedly in the background as the camera frame focuses on the couple. Nearby, a small child toddles around as the couple leans over the box, kiss, and slowly begin to open it to reveal what’s inside. In the US, gender reveal parties such as the Krummels’ are commonly used to mark the occasion of fetal gendering. 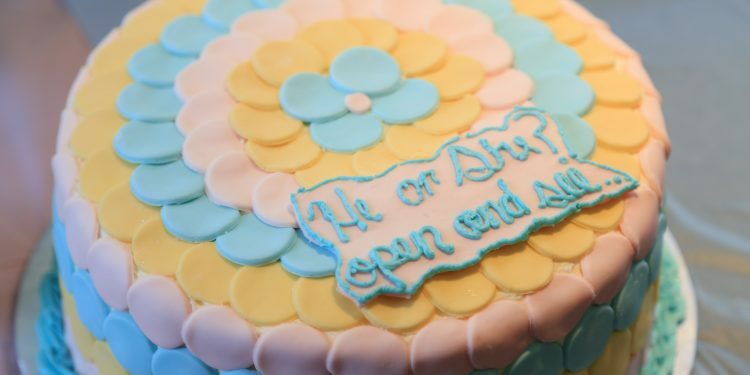 While this practice is enabled by medical technologies, and thus normally occurs within the context of a medical examination, the gender reveal party is meant to draw out and celebrate the anticipatory a/effects of gender’s symbolization. Stylized with pink and blue commodities, candies, and frosted foods, gatherings such as these are centered on the precise moment of gender assignment. Family and friends are often invited to these parties, during which they are asked to gather around the gendering object (e.g., a box, cupcakes, fireworks) that contains a pink or blue inside. The party and its lead-up prolong the anticipation of “finding out” until the very moment in which “boy” or “girl” is revealed through the ceremonious opening of the concealing container. The symbolization of binary gender is the climax. The contradictions of fetal gendering are poetically and conveniently condensed within this thirty-one second video. It is one of thousands of gender reveal videos posted on YouTube portraying a similar practice, in which family and friends gather for the ceremonial moment of gender assignment either during an ultrasound examination or during a gender reveal party. In most of the videos, one can witness the affective release that accompanies the illusion of the gender binary, as pregnant subject after pregnant subject (surrounded by family and friends) react to the moment of its ritual repetition. As the designated containers of gender are opened (or punctured or exploded) to reveal their pink or blue insides, or as the ultrasound technician pauses the screen and points to the chosen evidence for gender, the viewer can feel the affective ties of this practice, what it means for those being filmed to bring the imagined other (the expected child) into discourse through gender. Yet for the Krummels, the momentary impossibility of gender’s symbolization produces a very different response from those whose videos expose an easy pink or blue object. The anxious desire to gender, prolonged through these many steps and brought to the ultimate moment of camera-ready climax, falls flat. The gendering subjects — Joe and Leela — are not told what they have been promised to be able to know. We witness — in their faces, their words, their gestures — the distress of this failure. In the video’s YouTube description, the couple writes, “The whole party was ruined by a party store with an incompetent balloon employee who clearly had no idea what a gender reveal party is.” Today.com (the website of NBC’s The Today Show, a morning show in the US) shared the couple’s story, speculating, “It’s possible the party-store employee thought ‘gender reveal’ had something to do with the LGBTQ community, and so he gave them balloons that symbolized a rainbow.” But perhaps an even more queer conclusion could be drawn. We might imagine that the worker behind this “failure” offered up these rainbow balloons a sort of undoing, a way of momentarily, and playfully, queering the social order, recognizing gender reveal parties as a staging of a discursive practice with profound ideological effects, and refusing to uphold their part in the reproduction of cisnormativity. Regardless of the source of the supposed failure, what is revealed in this video is the precarity of gender assignment and its surrounding cultural practices like the gender reveal party. One must be acquainted with this gender performance and the meanings its symbols are meant to convey in order to properly uphold it. One misstep, one “failure” or moment of “incompetence,” disrupts the entire line of discursive production upon which the performance relies. When a failure does occur, like in the case of the Krummels, the anxiety that gender is meant to cover is suddenly exposed. The unanalyzed system of cisnormativity suddenly reveals its flaws and the gendering subjects are face to face with a laceration in the discursive loop that was thought to smoothly reproduce itself. In the interview with Today.com, Leela Krummel shares that during those thirty-one seconds she was “just trying not to cry” as Joe searched the bottom of the box for the card that would tell them their desired answer to gender. Yet despite the frustration and disappointment displayed by the Krummels, they posted their “fail” online. The video went viral across several national media outlets, and their documented failure was swiftly turned into a commodity. The viral story also became a platform for a mix of publicly circulated emotions discussed across the Internet: simultaneous enjoyment, laughter, frustration, sadness, and the embodiment of both resistance and conflict, possibility and mourning. In the YouTube video comments, commenters argue about the nature of gender, pushing and pulling discourse to make meaning out of the rainbow balloons. What happened here? What does it mean? Whose failure was it? In this moment of witnessing her child’s gender assignment — in the ambivalent, liminal space where Stryker stands and shares with her readers — we see the system of cisnormativity produce the very terms of recognition that alienate those whose subjectivities undermines them. We see the cistem adamantly upheld by the medical authority — the one who speaks, “it’s a girl” — and deeply desired and celebrated by the Krummels and thousands more posting their videos on YouTube. With Stryker as a situated outsider, and the Krummels as insiders, their stories and anxieties illuminate the hegemonic terms by which humanness is conferred in US society (Butler, 2001). And these terms are shaped by the order of cisnormativity. Julia Kristeva (1980) writes of pregnancy, “Within the body, growing as a graft, indomitable, there is an other. And no one is present, within that simultaneously dual and alien space, to signify what is going on” (p. 237). It is through the organizing force of cisnormativity that the blurry output of the ultrasound becomes something else for the gendering subject. Transposed from the pregnant subject’s body into, in the Krummels’ case, a box in a backyard, the humanity of the imagined other is made intelligible by its gendered symbolization. Cisnormativity shifts language from “it” to “he” or “she”, and “he” comes to signify something “real”, some one one could imagine. Here, “one does not ‘do’ one’s gender alone. One is always ‘doing’ with or for another, even if the other is only imaginary” (Butler, 2004, p.1). We see, in the case of the Krummels, and again and again through the hundreds of thousands of gender reveals posted on YouTube, how this practice launches the pregnant subject into the future-made-present. Assigning gender offers, for some, an illusion of certainty; the potential to imagine stasis during an experience otherwise riddled with ambiguity, unanswered questions, and utter uncertainty (Gentile, 2013). Imagining oneself as, say, the mother of a little boy offers the possibility of obscuring the pregnant anxieties of the present by populating the social fantasy of the future normative child. The anxiety of pregnancy is simultaneously confounded by the “regulatory anxiety” of gendering experienced by many (Corbett, 2011). When cisnormativity fails, even momentarily, it pulls the cisgender subject out of themself, causing — for many — a fundamental undoing as they are forced to recognize the limits of the discourses that define them. Stryker suggests that an encounter with a person whose gender is not legible within the order of cisnormativity “can invoke in (cisgender) others a primordial fear of monstrosity, or loss of humanness,” inciting feelings of “hatred, outrage, panic, or disgust”, and, far too often, physical violence (Stryker, 2006, p. 6). This gut-level fear of the unintelligible, the illegible other, represents an integration of cisnormativity at the level of the psyche, one that reproduces itself beyond language, at the level of affect. This occurs in any number of moments, but is placed front and center in the spectacle of the gender reveal. Spend some time with YouTube gender reveal party videos and you’ll see –even feel — the affects of cisnormativity as you watch the faces of the gendering subjects on the screen. If we return to the failure with which we began, we can begin to consider the magnitude of the rainbow balloons, their utter disruption of a gendering practice meant to quell the anxieties, and to contain and facilitate the reproduction, of cisnormative subjects. And we see, in the Krummels’ gender reveal video and its viral aftermath, the momentary disintegration of cisnormativity. The failure of gender momentarily renders the cisgender other, and thus the “properly” cisgender self, unimaginable (Larkin, 2006). And from there, we can simultaneously begin to map out the ways such gender disruptions are avoided at all costs in American society, not only at the level of hopeful parenthood, but through the proliferation of transphobic legislation, cisnormative reproductive practices, the cisnormativity of toy aisles and clothing shops. Cisnormativity and its ideological a/effects do not only unfold within medical examinations or backyard parties, in these private moments of failure and recognition, but also in the letter of the law, of medicine, in the order of public space. It is tightly packaged so-as to avoid the possibility of failure. Yet, its precariousness is tangible, exposed, enacted, even exploded onto the screen, sending people screaming. So, as we see with the Krummel’s “incompetent balloon store employee,” failure (resistance) is abundant. Emily Breitkopf is a doctoral candidate in clinical psychology at NSSR and a 2018 fellow in the Integrative PhD program. Her dissertation examines discursive and affective practices of gendering during pregnancy in the US context.